Electronic signature or e-signature is legally enforceable and a valid way to obtain the intent to sign on any electronic records or documents. “Electronic” – The term “electronic” means relating to technology having electrical, digital, magnetic, wireless, optical, electromagnetic, or similar capabilities. “Electronic Agent” – The term “electronic agent” means a computer program or an electronic or other automated means used independently to initiate an action to respond to electronic records or performances in whole or in part without review or action by an individual at the time or the action or response. “Electronic Record” – The term “electronic record” means a contract or other record created, generated, sent, communicated, received, or stored by electronic means. The world is widely adopting online or electronic transactions including electronic documents and contracts. Electronic signatures, which is a way to capture the esignature on the electronic document online, has become a crucial part of online transactions as it helps companies close deals or sign important documents quickly and efficiently while cutting costs significantly. 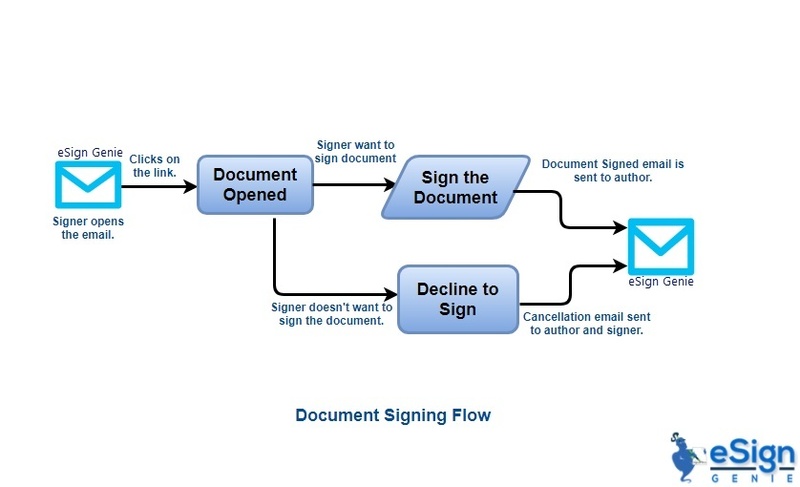 Electronic document signing has been enacted legally as equivalent to hand written signature or wet-ink signatures in the US by the ESign Act of 2000 (US Federal Law), UETA and other regulation, Canada by PIPEDA law, European union by eIDAS regulation (European Union), UK by Electronic Communications Act 2000 (UK) and other similar laws in a whole host of countries around the world. 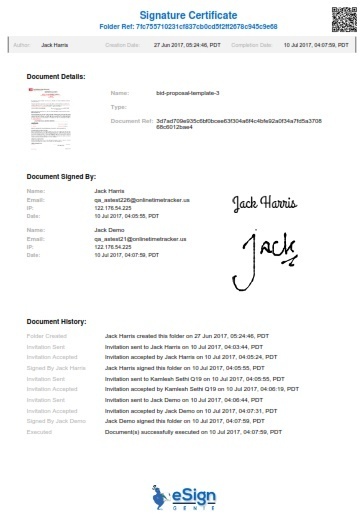 While electronic signatures consist of simply entering the name during signing online (which still needs be captured with additional information associated with the esignatures), it is widely supplemented by digital signatures which adds non-repudiation and tamper-proofing element to any electronic signatures making them highly secured. Please read more about the Electronic Signatures vs. Digital Signatures non-technical blog to clarify the difference between the two forms of signatures. eSign Genie provides easy to use, legally binding and most comprehensive electronic and digital signatures. If you are still using web-based checkbox based acceptance or email based approval, you can benefit from our affordable service to send documents and obtain legally binding and highly secured e-signatures. You can expedite the document signing process significantly and get real time insights into the contract status after sending. You can upload PDF document from computer, Google Docs and Dropbox to create a reusable template (to be reused frequently) or document (to be used only one time). You can place fillable fields like text, text boxes, check boxes, radio buttons, date, attachment, secured fields, signature, email and name etc. type of fields. Assign the fields to the person responsible for filling out and signing. Enter recipient name and email and send via unique secured link email. Document recipient can review fill out document and sign the document. Signer can create signatures online or upload signature file or simply select font type of signatures. 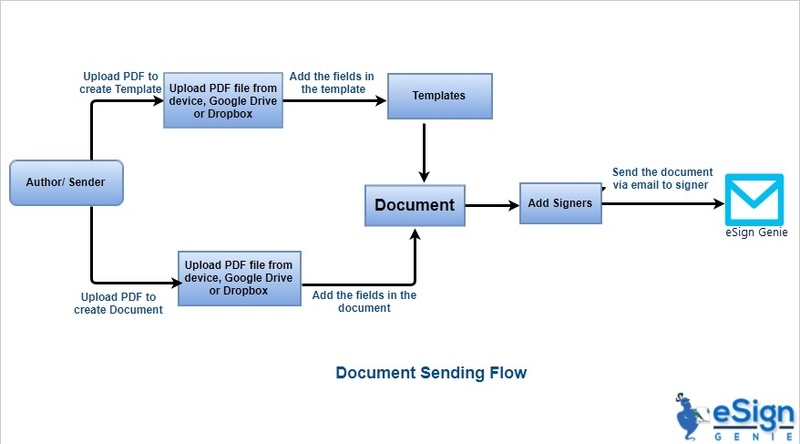 If there are multiple signers, document is completed/executed once all parties have electronically signed the document. Document status can be seen by the document sender anytime in the process. You can enable the notifications to obtain emails. Completion certificate is generated upon esigning which provides the history of the document from start to finish including names of signers, date, time and IP addresses of the signers. You can always use advanced authentication methods while esigning. All signers get a copy of the signed document(s) along with the e-signature certificate. Document protection and security is absolutely essential for documents that require signature. eSign Genie document are stored on servers in highly secure US Data Centers with SSAE 16 facilities SOC 2. eSign Genie provides one of the highest bank grade security with 256-bit SSL encryption, encryption of sensitive stored data, granular access control and conforms to Esign Act, UETA, FINRA, HIPAA, FDA CFR Part 11 and PCI Compliances. eSign Genie practices, processes and guidelines ensures that your document and content data protection, confidentiality and integrity is maintained at all times.